- We have included a set of the latest trendy Windows 7, Mac, Glass and Metro styles. - Our menu templates are approved by professional designer and usability expert. Color contrast, font sizes and spacing are just right! - Our menu maker offers by far better visual fade, cross-fade and shadow effect choices than any competitor. - The generated menu code is clean, lightweight and standards-compliant. 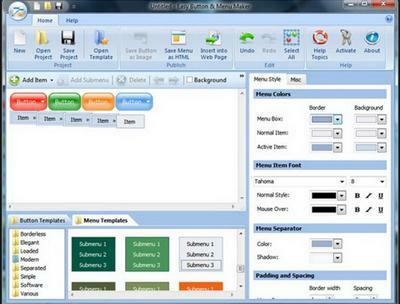 Unlike most other menu maker tools, Easy Button & Menu Maker provides direct WYSIWYG visual menu editor, so it is much easier and pleasant to work with. Menus created with Easy Button & Menu Maker are quick, compact and compatible with all modern web browsers.